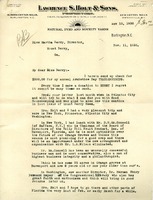 In this letter Chester Martin is sending Bessie Bonner a leaflet about the Berry Schools and informs her it may contain some mistakes, which she should correct. 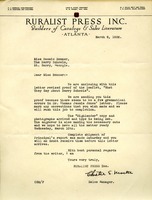 He also informs her of the status of the engraving and the "Highlander" copy and photographs. 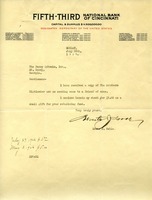 In this letter 5/3 bank of Cincinnati Monte J Goble sends Martha Berry five dollars for a copy of The Highlander.